We tested the best soundbars under $500 to see which ones are worth the money. We tested some of the most popular and highly acclaimed soundbars to find the best you can buy under $300. From frills-free to smart, these are the best 32-inch options around. 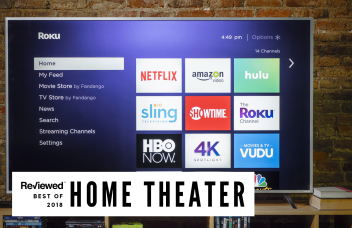 These are the best TVs you can buy that have Roku built right in. Our picks for the best indoor HDTV antennas available today. Vizio has cut prices on two of our favorite 2018 TVs, including the 65-inch P-Series Quantum. If you want to watch March Madness but don't have cable, fret not—there's ways to watch without it. Some streaming apps offer a DVR feature—here's what you need to know. Here's everything you need to know about how to watch the 2019 Oscars. There's better things to do with an old TV than kicking it to the curb. How long should a new LED or OLED TV last? The results might surprise you. You can't replace your TV's screen without buying a whole new one—but you can upgrade its audio quality by letting a soundbar do the work. It's 2019—is Apple TV still worth it?